Abbahu and Ḥiyya b. Abba. A celebrated Palestinian amora of the third amoraic generation (about 279-320), sometimes cited as R. Abbahu of Cæsarea (Ḳisrin). His rabbinic education was acquired mainly at Tiberias, in the academy presided over by R. Johanan, with whom his relations were almost those of a son (Yer. Ber. ii. 4b; Giṭ. 44b; B. B. 39a). He frequently made pilgrimages to Tiberias, even after he had become well known as rector of the Cæsarean Academy (Yer. Shab. viii. 11a; Yer. Pes. x. 37c). He was an authority on weights and measures (Yer. Ter. v. 43c). He learned Greek in order to become useful to his people, then under the Roman proconsuls, that language having become, to a considerable extent, the rival of the Hebrew even in prayer (Yer. Soṭah, vii. 21b); and, in spite of the bitter protest of Simon b. Abba, he also taught his daughters Greek (Yer. Shab. vi. 7d; Yer. Soṭah, ix. 24c; Sanh. 14a). Indeed, it was said of Abbahu that he was a living illustration of the maxim (Eccl. vii. 18; compare Targum), "It is good that thou shouldest take hold of this [the study of the Law]; yea, also from that [other branches of knowledge] withdraw not thine hand: for he that feareth God shall come forth of them all" (Eccl. R. to vii. 18). Being wise, handsome, and wealthy (B. M. 84a; Yer. B. M. iv. 9d), Abbahu became not only popular with his coreligionists, but also influential with the proconsular government (Ḥag. 14a; Ket. 17a). On one occasion, when his senior colleagues, Ḥiyya b. Abba, Ammi, and Assi, had punished a certain woman, and feared the wrath of the proconsul, Abbahu was deputed to intercede for them. He had, however, anticipated the rabbis' request, and wrote them that he had appeased the informers but not the accuser. The witty enigmatic letter describing this incident, preserved in the Talmud (Yer. Meg. iii. 74a), is in the main pure Hebrew, and even includes Hebrew translations of Greek proper names, to avoid the danger of possible exposure should the letter have fallen into the hands of enemies and informers (compare 'Er. 53b). After his ordination he declined a teacher's position, recommending in his stead a more needy friend, R. Abba of Acre (Acco), as worthier than himself (Soṭah, 40a). He thereby illustrated his own doctrine that it is a divine virtue to sympathize with a friend in his troubles as well as to partake of his joys (Tan., Wa-yesheb, ed. Buber, 16). Later he assumed the office of rector in Cæsarea, the former seat of R. Hoshaya I., and established himself at the so-called Kenishta Maradta (Insurrectionary Synagogue; Yer. Naz. vii. 56a; Yer. Sanh. i. 18a; compare Josephus, "B. J." ii. 14, § 5; Jastrow, "Dict." p. 838), whence some of the most prominent teachers of the next generation issued. He did not, however, confine his activity to Cæsarea, where he originated several ritualistic rules (Yer. Dem. ii. 23a, R. H. 34a), one of which—that regulating the sounding of the shofar—has since been universally adopted, and is referred to by medieval Jewish casuists as "Takkanat R. Abbahu" (the Enactment of R. Abbahu; compare "Maḥzor Vitry," Berlin, 1893, p. 355). He also visited and taught in many other Jewish towns (Yer. Ber. viii. 12a; Yer. Shab. iii. 5c). While on these journeys, Abbahu gathered so many Halakot that scholars turned to him for information on mooted questions (Yer. Shab. viii. 11a; Yer. Yeb. i. 2d). In the course of these travels he made a point of complying with all local enactments, even where such compliance laid him open to the charge of inconsistency (Yer. Ber. viii. 12a; Yer. Beẓah, i. 60d). On the other hand, where circumstances required it, he did not spare even the princes of his people (Yer. 'Ab. Zarah, i. 39b). Where, however, the rigorous exposition of laws worked hardship on the masses, he did not scruple to modify the decisions of his colleagues for the benefit of the community (Shab. 134b; Yer. Shab. xvii. 16b; Yer. M. Ḳ. i. 80b). As for himself, he was very strict in the observance of the laws. 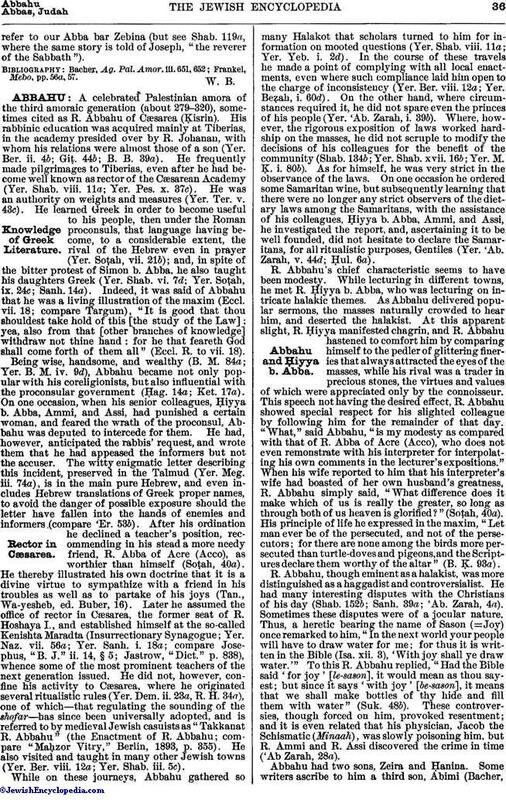 On one occasion he ordered some Samaritan wine, but subsequently learning that there were no longer any strict observers of the dietary laws among the Samaritans, with the assistance of his colleagues, Ḥiyya b. Abba, Ammi, and Assi, he investigated the report, and, ascertaining it to be well founded, did not hesitate to declare the Samaritans, for all ritualistic purposes, Gentiles (Yer. 'Ab. Zarah, v. 44d; Ḥul. 6a). R. Abbahu's chief characteristic seems to have been modesty. While lecturing in different towns, he met R. Ḥiyya b. Abba, who was lecturing on intricate halakic themes. As Abbahu delivered popular sermons, the masses naturally crowded to hear him, and deserted the halakist. At this apparent slight, R. Ḥiyya manifested chagrin, and R. Abbahu hastened to comfort him by comparing himself to the pedler of glittering fineries that always attracted the eyes of the masses, while his rival was a trader in precious stones, the virtues and values of which were appreciated only by the connoisseur. This speech not having the desired effect, R. Abbahu showed special respect for his slighted colleague by following him for the remainder of that day. "What," said Abbahu, "is my modesty as compared with that of R. Abba of Acre (Acco), who does not even remonstrate with his interpreter for interpolating his own comments in the lecturer's expositions." When his wife reported to him that his interpreter's wife had boasted of her own husband's greatness, R. Abbahu simply said, "What difference does it make which of us is really the greater, so long as through both of us heaven is glorified?" (Soṭah, 40a). His principle of life he expressed in the maxim, "Let man ever be of the persecuted, and not of the persecutors; for there are none among the birds more persecuted than turtle-doves and pigeons, and the Scriptures declare them worthy of the altar" (B. Ḳ. 93a). R. Abbahu, though eminent as a halakist, was more distinguished as a haggadist and controversialist. He had many interesting disputes with the Christians of his day (Shab. 152b; Sanh. 39a; 'Ab. Zarah, 4a). Sometimes these disputes were of a jocular nature. Thus, a heretic bearing the name of Sason (=Joy) once remarked to him, "In the next world your people will have to draw water for me; for thus it is written in the Bible (Isa. xii. 3), 'With joy shall ye draw water.'" To this R. Abbahu replied, "Had the Bible said 'for joy' [le-sason], it would mean as thou sayest; but since it says 'with joy' [be-sason], it means that we shall make bottles of thy hide and fill them with water" (Suk. 48b). These controversies, though forced on him, provoked resentment; and it is even related that his physician, Jacob the Schismatic (Minaah), was slowly poisoning him, but R. Ammi and R. Assi discovered the crime in time ('Ab Zarah, 28a). Abbahu had two sons, Zeira and Ḥanina. Some writers ascribe to him a third son, Abimi (Bacher,"Ag. Pal. Amor."). Abbahu sent Ḥanina to the academy at Tiberias, where he himself had studied; but the lad occupied himself with the burial of the dead, and on hearing of this, the father sent him a reproachful message in this laconic style: "Is it because there are no graves in Cæsarea (compare Ex. xiv. 11) that I have sent thee off to Tiberias? Study must precede practise" (Yer. Pes. iii. 30b). Abbahu left behind him a number of disciples, the most prominent among whom were the leaders of the fourth amoraic generation, R. Jonah and R. Jose. At Abbahu's death the mourning was so great that it was said, "Even the statues of Cæsarea shed tears" (M. Ḳ. 25b; Yer. 'Ab. Zarah, iii. 42c). There are several other Abbahus mentioned in the Talmudim and Midrashim, prominent among whom is Abbahu (Abuha, Aibut) b. Ihi (Ittai), a Babylonian halakist, contemporary of Samuel and Anan ('Er. 74a), and brother of Minyamin (Benjamin) b. Ihi. While this Abbahu repeatedly applied to Samuel for information, Samuel in return learned many Halakot from him (Naz. 24b; B. M. 14a, 75a; see Benjamin b. Ihi). Bacher, Ag. Pal. Amor. ii. 88-142. "When does your Messiah come?" a Christian (Minaah) once asked Abbahu in a tone of mockery; whereupon he replied: "When you will be wrapped in darkness, for it says, 'Behold, darkness shall cover the earth, and gross darkness the nations; then shall the Lord rise upon thee and His glory shall be seen on thee' [Isa. lx. 2]," (Sanh. 99a). A Christian came to Abbahu with the quibbling question: "How could your God in His priestly holiness bury Moses without providing for purificatory rites, yet oceans are declared insufficient?" (Isa. xl. 12). "Why," said Abbahu, "does it not say, 'The Lord cometh with fire'?" (Isa. lxvi. 15). "Fire is the true element of purification, according to Num. xxi. 23," was his answer (Sanh. 39a). Another question of the same character: "Why the boastful claim: 'What nation on earth is like Thy people Israel' (II Sam. vii. 23), since we read, 'All the nations are as nothing before Him'?" (Isa. xl. 17), to which Abbahu replied: "Do we not read of Israel, he 'shall not be reckoned among the nations'?" (Num. xxiii. 9, Sanh. as above). Abbahu made a notable exception with reference to the Tosefta's statement that the Gilionim (Evangels) and other books of the Mineans are not to be saved from a conflagration on Sabbath: "the books of those at Abidan may be saved" (Shab. 116a). 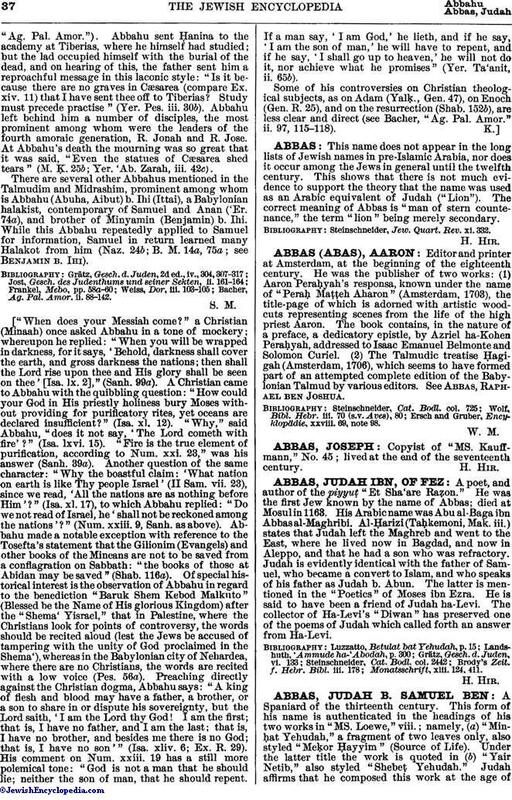 Of special historical interest is the observation of Abbahu in regard to the benediction "Baruk Shem Kebod Malkuto" (Blessed be the Name of His glorious Kingdom) after the "Shema' Yisrael," that in Palestine, where the Christians look for points of controversy, the words should be recited aloud (lest the Jews be accused of tampering with the unity of God proclaimed in the Shema'), whereas in the Babylonian city of Nehardea, where there are no Christians, the words are recited with a low voice (Pes. 56a). Preaching directly against the Christian dogma, Abbahu says: "A king of flesh and blood may have a father, a brother, or a son to share in or dispute his sovereignty, but the Lord saith, 'I am the Lord thy God! I am the first; that is, I have no father, and I am the last; that is, I have no brother, and besides me there is no God; that is, I have no son'" (Isa. xliv. 6; Ex. R. 29). His comment on Num. xxiii. 19 has a still more polemical tone: "God is not a man that he should lie; neither the son of man, that he should repent. If a man say, 'I am God,' he lieth, and if he say, 'I am the son of man,' he will have to repent, and if he say, 'I shall go up to heaven,' he will not do it, nor achieve what he promises" (Yer. Ta'anit, ii. 65b). Some of his controversies on Christian theological subjects, as on Adam (Yalḳ., Gen. 47), on Enoch (Gen. R. 25), and on the resurrection (Shab. 152b), are less clear and direct (see Bacher, "Ag. Pal. Amor." ii. 97, 115-118).